The way you dress your bed can have a huge influence on the look and feel of your bedroom, and the range of different possibilities for giving your room more personality and style with the right bed dressings is endless. St. Louis’ and Indianapolis’ go-to source for high-quality home décor and bedroom furniture, Weekends Only Furniture & Mattress, is here with a list of their five favorite dressing styles for your bed. Flowers are in, and a bright floral pattern is a great way to make your room seem more energetic and lively. The great thing about floral patterns is there are many different color combinations, so there’s sure to be one that matches your personality. 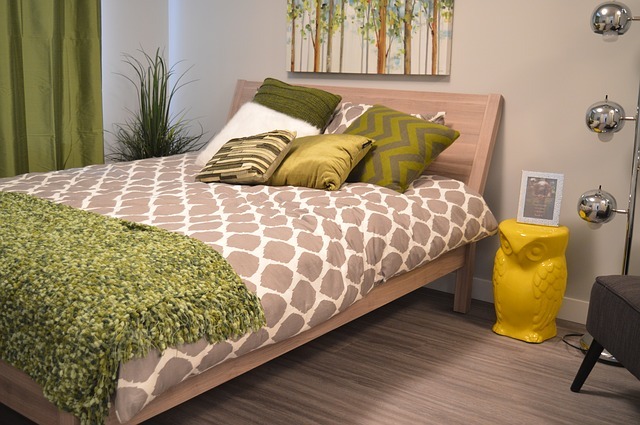 Bring out the green and brown tones to add some life to your bedroom with a nature-themed bed. Great for bedroom furniture made of wood, a nature theme gives you an easy way to tie in the furniture to the rest of the home décor. To finish the look, incorporate throw pillows and a blanket made with natural, eco-friendly fibers. Embrace your inner hippie with a bohemian-style bedroom. Mix together different patterns and colors on the bed to create an eclectic look all your own. With a boho chic style, the rules go out the window, so explore how the textures and styles work together. Of course, balance is key, so for every bold color or crazy pattern, incorporate a neutral piece of home décor to compensate. For modern homes, a floral quilt isn’t the look you want. Pair blocky, sleek bedroom furniture with a bedspread in a bright color like red or green. Use throw pillows to add some texture or patterns, or for an even bolder statement, skip the patterns altogether. As popular as patterns and brightly colored bedspreads are, sometimes, a more understated look is the right fit for the room. If simple is more your style, choose a plain white bedspread. You can add in color and patterns through other home décor elements. Are you ready to give your bed a fresh new look? Head over to one of Weekends Only Furniture & Mattress’s locations to explore their great selection of bedroom furniture, mattresses, and home décor accessories. Give them a call at (855) 803-5888 or visit their website to learn more.